Nothing like a pesky fly to ruin a perfectly good lazy day. And while fly swatters are necessary evil, the don’t really have to be downright fugly. Dutch industrial designer Ramon Middelkoop also echoes this sentiment and has created a fly swatter that looks more like a decor object than an insect killing contraption. The Fly Wing Flapper will take on irritating insects with ease and more importantly style. 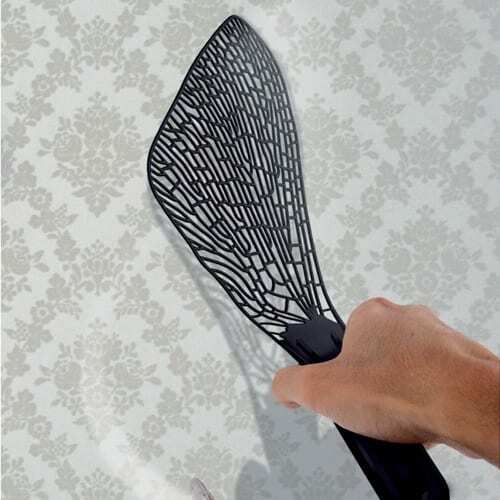 The plastic fly swatter has been patterned on insects wings and kudos to the designer to make a hackneyed object into something so artistic. The art of killing really takes on a whole new meaning.